I’ve seen Fight Club about 58 times. It’s my favourite film. I love it so much I even had the above quote engraved onto the back of my iPod. 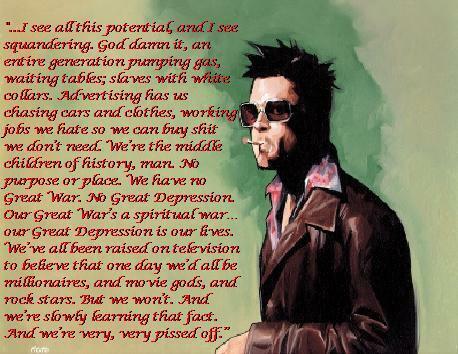 In the film, Brad Pitt’s character Tyler Durden is a pretty heavy anti-consumerist. He is disturbed by the way people look for self-esteem and happiness in material things, and senses a better way. First you want the iPod. Then the clothes, the car, the big house, the boat, the bigger house, the bigger boat. You get stuck on a hedonic treadmill; today’s luxuries are tomorrow’s necessities, as your income and consumption rise, so do your desires and expectations. It’s like moving to a higher weight division in boxing – you can do it, but there’s always a bunch of bigger guys there waiting for you. Another study found a way to manipulate how important people think money is: they had people write out a list of their inadequacies. Once their failings had been literally spelled out for them, they thought money was more important. Their self-esteem had lowered, and they thought money could fill the gap. When the road to their goals and values is paved with the occasional negative experience, they tend not to walk the path, preferring to develop avoidance strategies. Ultimately, living in fear of negative thoughts, experiences and behaviours is associated with a number of negative mental health consequences, and is emotionally draining. This isn’t a black and white thing, and experiential avoidance may not be the defining feature of a person; but it tends to be more pronounced in people who have strong material desires. As satisfying as it would be to say that materialism causes all the above ailments, the evidence isn’t clear. All the above studies are correlational, so they can’t tell us what is causing what. It could be that people develop unhappiness, mental health problems or experiential avoidance first, and then turn to material goals as a way of coping, as in point 4. Clearly though, if this is the case, materialism doesn’t seem to be the answer. How can we reduce materialism? emotional reactions by shifting attention to the heart. about some of the things that came to mind. Simpler gratitude exercises have been tested, such as each day writing down three good things that happened that day, and why they happened. One way to do this is through mindfulness meditation. I’m not qualified to give a run-down of how to meditate, but there are some good resources online: John Kabat-Zinn walks you through it in this video, and you can get guidance in mp3 format from Mental Workout (they are cheap: $1-2 each; I’m going through a few of their programs they seem pretty good so far). Otherwise, just Google. 3) Watch Fight Club 58 times. (1) Diener, E. and S. Oishi: 2000, ‘Money and happiness: Income and subjective well-being across nations’, in E. Diener and E.M. Suh (eds. ), Subjective Well-beingacross Cultures (MIT Press, Cambridge, MA). (2) Kasser, T., & Ryan, R. M. (1993). A dark side of the American dream: Correlates of financial success as a central life aspiration, journal of Personality and Social Psychology, 65, 410-422. (3) Dickens, C. (1843). A Christmas Carol in Prose. (6) Kashdan, T., & Breen, W. (2007). Materialism and diminished well-being: Experiential avoidance as a mediating mechanism. Journal of Social & Clinical Psychology, 26(5), 521-539. (7) Lambert, N., Fincham, F., Stillman, T., & Dean, L. (2009). 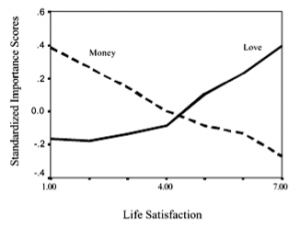 More gratitude, less materialism: The mediating role of life satisfaction. The Journal of Positive Psychology, 4(1), 32-42. Wow,you have some great info. What I found humorous right away was that you engraved the quote into an object of materialism. Interesting how it is difficult to escape, but maybe technology in a way is helpful in the escape as we rely less on sensation and more on the rational calculations of a computer. I am writing a research paper and your page is invigorating the thought process. I wish I never started however. It gets too complex to have a time limit on the thought. I totally forgot what it was called but it’s human nature to spend more as you earn more. So I guess the richer you are, the more compulsion it will be to spend more. This also explains why it’s very difficult to save money. It’s totally natural — but it can be controlled.